Cotton, polyester and mohair stage curtains are the most traditional flame-retardant theatre drapes on stage. Manufactured as luxurious front curtains, borders, legs, valances and stage backdrops, they serve a decorative purpose on stage while improving lighting and sound conditions. Directing sound and light is essential on stage. A perfect theatre experience therefor requires framing the image right, so the performance can make the biggest impact possible. Stage masking draperies are used at the side limits of the performing space to conceal offstage areas and equipment from the audience’s view. These so-called “borders” and “legs” of the theatre are made from light masking fabrics that partially or completely block atmospheric light in order to create a black box on stage. They also meet the most specific onstage demands for minimum light reflection. Looking for a product overview? Apart from absorbing light, some theatre masking curtains can also be used as acoustic drapes. Engineered for maximum sound dampening and low reverberation levels, these acoustic stage curtains should be heavy-weight and porous, in order to improve sound quality within a venue. You can view all ShowTex acoustic solutions for theatres, or read our definitive guide to acoustic fabrics if you want to learn more about acoustic drapes in general. Backdrops are theatre curtains that hang in the back of the stage and can be used for projection or lighting effects. Often, they are made from canvas and printed or painted with custom artwork to create theatrical scenery. Learn more about stage backdrops by reading our guide: how to choose a stage and event backdrop. The most famous and visible theatre curtain is, of course, the front-of-house or main curtain. Traditionally made from flame-retardant velvet, it is the visual barrier between the theatre stage and the audience before the show begins. 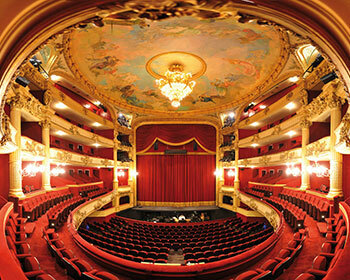 Theatres have a personality that can be emphasised with custom-sewn grand drapes. These stage velvets are produced from cotton or synthetic materials, available in a variety of weights, and can be custom-dyed on request. The traditional cotton theatre velvets feature a directional-pile and a striking matte finish. Choose one of the stylish colours of the velours Puccini, Verdi and Bellini, or discover the budget range of 100% cotton velvets, including the medium-weight Velours Hamlet and the noticeably heavier Velours Atlas. While cotton velours are chemically treated to make them flame-retardant (FR), IFR polyester velvets are produced using materials that are inherently and permanently flame-resistant. These stage velvets are ultra-low maintenance and more resistant to moisture or wrinkling than any other kind of theatre velvet. This makes them more suited for touring than cotton stage velvets. Learn more about Trevira CS theatre curtains. The velours Helena CS, Garnier CS, Paris CS and the extra heavy-weight Zeus CS feature an upright pile and light satin sheen, while the cost-effective Velours Delta and Velours Bravo stage velvets are extra-wide and guarantee a more matte, deep black colour thanks to their short pile. 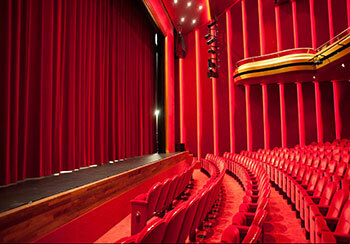 Mohair stage velvets offer the most luxurious main house theatre curtains with maximum endurance and sustainability. The heavy-weight Velours Gaudi and the even heavier Velours Palladio theatre drapes are extremely durable and have a long upright satin pile, good acoustic qualities and excellent colour clarity. Take it one step further and give your Mohair theatre drapes their very own character by adorning them with your personal designs or patterns. Logos or custom designs can be woven right into our Velours Mackintosh, while our Velours Le Corbusier can be embossed with historic pressed velvet patterns. 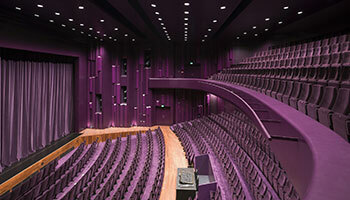 Draperies and textiles used in public venues like theatres and auditoriums are required by local legislation to meet specific flame-retardant standards. As these standards and certification requirements vary both internationally and regionally, ShowTex conducts a variety of tests on all its fabrics to provide worldwide customers with the most advanced flame-retardant theatre fabrics. 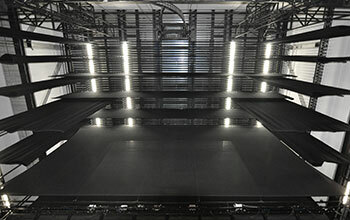 Find out more on fire-rated theatre drapery in our blog post about flame retardant standards. A front curtain is the stage curtain or curtains at the very front of a theatrical stage. Typically, this theatre drape opens at the beginning of a performance to reveal the stage. 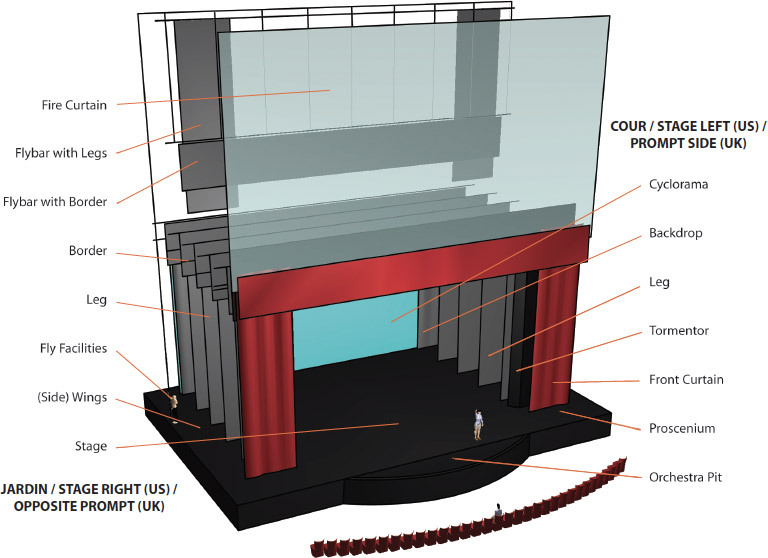 Eager to discover the many different styles of theatrical stage drape openings? Check out our blog post "curtain openings". Theatre curtains can be sewn flat or with pleats for more fullness. Pleating is commonly used to increase opacity, light and sound absorption, or to add more depth to the drape. 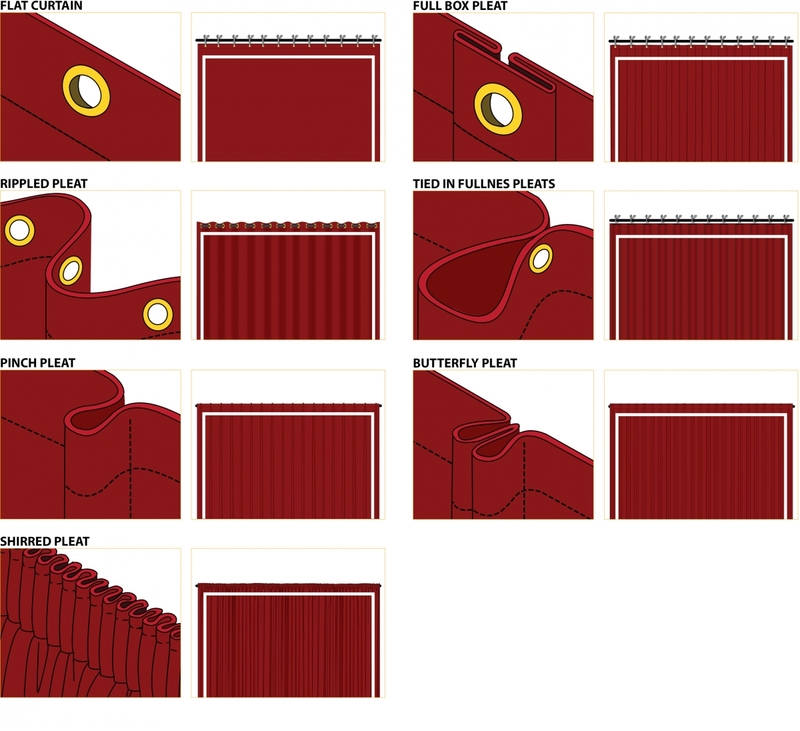 Curtains can be pleated according to the fabric, application, and dimensions of the curtain. For 100% fullness, account for twice the amount of fabric used for a flat curtain. For 50% fullness, account for 1.5 the amount of fabric used. When in doubt, just ask. We are always happy to help. We have a long history of working together with theatres. Be sure to take a look at our portfolio to see the various projects we have worked on.